I know this rifle comes with a little scope, id rather replace it with a 3-12, any suggestions as to what scope and rings would work well with this rifle? Thanks!! It's all going to come down to personal preference. I would look into UTG or hawke with some dovetail rings. How far into the chamber does the bolt push the pellet? Is there a small teat (extension) on the end of the bolt to seat the pellet? If so, how long is it? Thanks! I have an ATM Night Vision Scope to mount on the .22 Seneca PCP Pump air rifle and would like to know what is the proper mount as the ATM Scope needs the Picatinny Rail,,, So what mount will I need here? I would get a picatinny to dovetail offset adapter rail. You realize the gun has a built in pump, right? So the fill probe is not required to fill the gun. That said, yes, fill probes will be available. Anybody have an idea how reliable the pump is going to be on this gun? I'm not to crazy about having to rebuild the pump on this thing every 100 or 200 hundred shots. I've been watching the vids on rebuilding the Benjamin hand pump and read the reviews for it and am afraid this gun can have the same problems. Is there any lubricant in the box? Which lubricant for pump head? Which lubricant for pump assembly pivot points and general lubrication? How come the gun in the pictures clearly has it marked as a .25 cal 6.35mm but you dont seem to offer that caliber for sale? Maybe because it's not available for pre-orders just yet? Given skills and fancy tools, would it be possible to shorten the shroud to expose 1/4" of actual barrel beyond the shroud? Strangely, I want to defeat any sound moderating devices. Anyone with experience shooting the gun for accuracy without the shroud? The shroud kind of holds the barrel in position. But it would be a simple matter to 'shorten' the shroud to do what he wants. Why not just remove the shroud? It is possible to remove it. If they come out with.25 before I get my .22 can I change my order to the.25. Give the PA sales dept a call, they should be able to assist. Do you know if the scope is 30mm or 1 inch. I have 1 inch UTG I want to put on it. I need to know Incase I need to buy a new set of scope Rings. does the scope arrive sited in? Probably not I mostly likely have to take the 20 for $20 deal correct? How accurate is this rifle out of the box? How easy is it to pump to 60 pumps? No, the scope does not arrive sighted in. 20/$20 service would be the best option to get it sighted in. If you keep the pressure in the optimum range, the two or three I've shot have been very accurate out to 50 yards. Definitely squirrels head accurate at that distance. Pumping isn't too tough in my opinion, though 60 continuous strokes will take a toll. Best to fill it up and then maintain a consistent pressure range by pumping a few times every shot or two. Did anyone notice that on the second to last pic its a .25 6.35mm. Thats the one I want. Says "side lever" - but since pic is not very clear, I assume it actually folds "down" - not to the side? Does the velocity / power of each shot fall off as the pressure in the tank declines? IE first shot is the most powerful, then all subsequent shots fall off from there. OR is it only as the tank gets quite low that you notice a difference? The side lever refers to the cocking bolt. The pump itself is located on the underside of the gun. No, if you were to fill the rifle to 3600 psi, it will preform the same way any unregulated PCP does, the velocity will come up until you hit the sweet spot (usually between 2000-2700 psi in .177 and .22) and then decline once you are beyond it. The idea is to use the pump to keep your pressure constantly in the sweet spot. Any idea on how much this weighs in .22? What's the weight of the .22 version? can this gun use Benjamin air gun mags? Is the end of the shroud threaded so you can add a moderator? Will the Seneca Aspen be offered in .25 caliber? Look at the front page of the manual. 3 calibers are listed, with an 8 shot magazine in .25.
do it yo self ,very easy to work on !!! You would have to call the tech department and ask at PA and ask. Does the gun include any kind of dessicant to absorb moisture when pumping? If so, what maintenance does that require? What size are the scope rings? High? Who makes the scope that comes with the Seneca aspen? 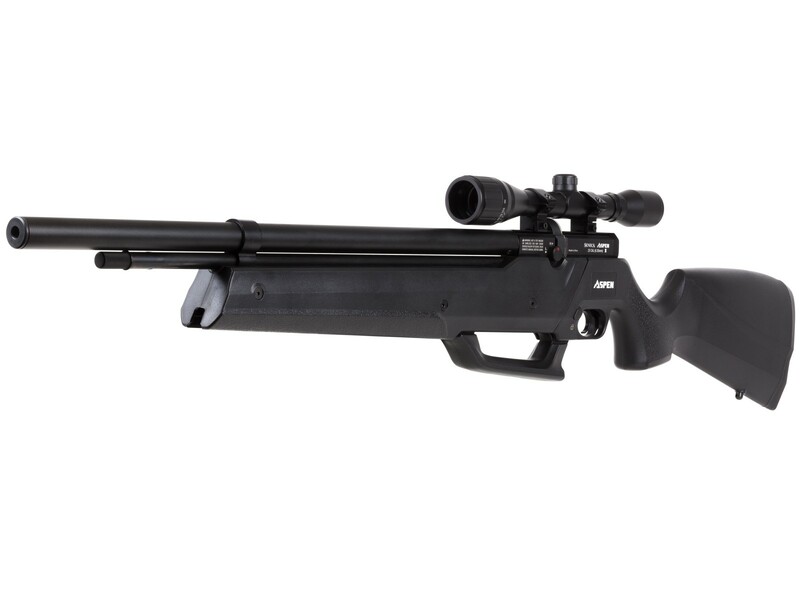 Hello any chance for this rifle to be ship to Canada? If yes, what are the steps? thank you. Tyler, When HAM tested it they didn't really address the pump. What kind of spread do you get when you shoot, pump twice, shoot, pump twice...or something like that? Because you'd be basically self regulating the pressure that way, it should be very consistent. Probably 10-15 fps or less. The gun over the course of a fill, when in the optimum pressure range will produce 10-15 fps spreads on high power without pumping after each shot, so keeping the pressure consistent should maintain at least that spread or better it. Wait. Isnt this the Nova Freedom? Same gun, just with a scope instead of open sights. Can you also fill air with a tank too? This is very appealing product. Approximately how many pumps to fill after one 10 shot mag at high pressure?